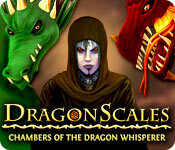 DragonScales: Chambers of the Dragon Whisperer is rated 3.8 out of 5 by 26. Rated 4 out of 5 by SynthpopAddict from 4.5 stars: Beautiful strategy game, a little short. [review based on completed game] Pros: unique concept, most levels untimed, beautiful graphics/music, lots of powerups Cons: difficulty is all over the place, game length, can't skip tutorials This is a game that's easy to pick up, yet will still mentally challenge you. Only 9 of the 56 levels are timed, so for the most part it's not a click as fast as you can game. Even on the timed levels, the timer is pretty generous on most of them. The amount of powerups available looks like overkill because I only used three of them, and not all that often. Players can replay boards previously completed to earn more coins to buy additional powerups for later boards. The HD graphics are beautiful and so is the soundtrack, which is very peaceful. The dark master character who does the game tutorials is very helpful, but unfortunately you can't skip the tutorials if you decide to replay boards or if you're starting a new game. I also noticed that the level difficulty fluctuates over all over the place even within one dragon chamber. Some boards were very easy, then there would be one that would be a real stumper, followed by easy/medium ones again. Whatever you do, don't click reset board on a timed level as that will cause that board to be an exercise in frustration [not sure if this is a glitch in the code?] I found that once I got the hang of playing, it wasn't that hard to complete the game, so I'm glad I bought it during a sale as the game length was a bit short at 4-5 hours. If you like strategy games that will challenge you yet not extremely hair-pulling hard, you'll enjoy this one. Rated 4 out of 5 by kim0530 from Something New and different Demo On one way, it'a a M3 but on the other hand you have do the reverse. Except removing your adding and there are times you can only have one certain color on the scales. You do get rewards but you have to use them wisely. There will be obstacles along the way along with more colors. At this point of time, I'm playing only the demo and found out that I really enjoyed this. Plus, if you like dragons that's another plus. The only thing I don't like is the creepy man and the music (got on my nerves). Other then that, is new and different. Rated 4 out of 5 by dachsy from Excellent Match 3 Innovation This is an excellent twist on a Match 3 game, whereby you place tokens, in this case, dragon scales on to the board in order to make matches of 3 or more. The matched tokens are then removed, scoring points. Others have described the story and game mechanics etc., so I won't repeat. What is innovative is that in this game, and what makes it different from normal Match 3's, is that you quickly realise that strategy is important - perhaps not so much in the earlier levels, but certainly so as the game progresses. 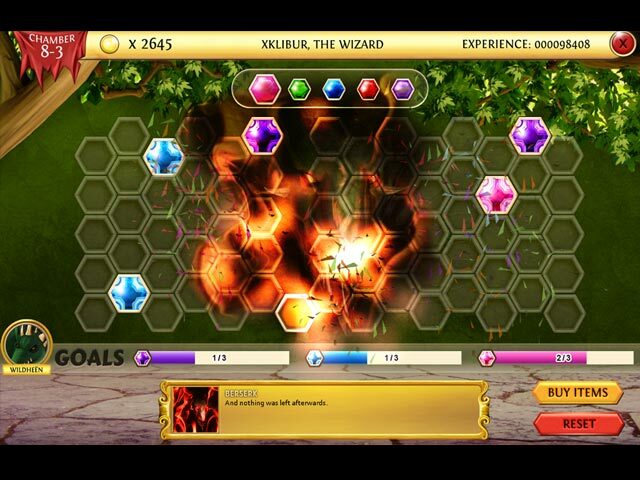 The HD graphics, fine sound effects and excellent power ups make for a pleasurable game experience. If you are into Match 3 games and don't mind using some brain power, I would certainly recommend this game. It is a buy for me. Rated 4 out of 5 by pennmom36 from Match 3 Dragon Scales Great new concept for a Match 3 game with HD graphics! You are given 3 scales at a time, of different colors, to place onto a honeycomb grid, you can place the first scale anywhere on the grid but the following two can only be placed around the first tile upon the highlighted areas. Once you have made a match of at least 3 of the same colored tiles, those tiles will be removed and if you are able to make matches of 2 different colors as a combo, the dragon will make an appearance, called Dragon Madness and destroy three random tiles. As you progress, you earn bonuses but you have to visit the shop and equip yourself with those bonuses before the start of each level. You are given 2 slots for bonuses and more are available but you have to purchase those slots. Each level has to be completed before the moon bar timer depletes and there are other quests such as matching specific colored tiles to complete the level or making a certain amount of matches. 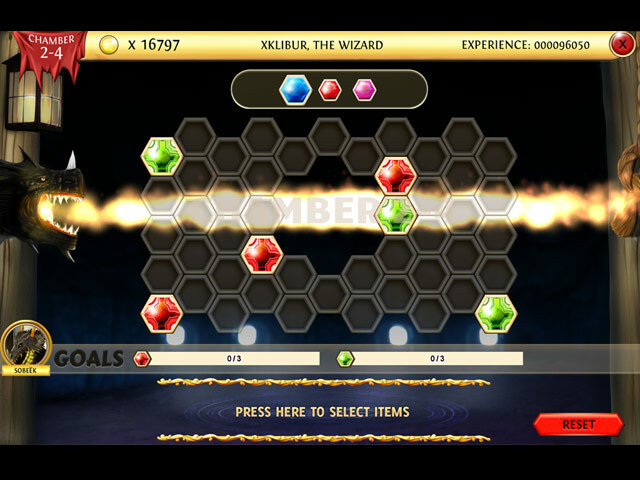 The bonuses available are, Dragon Slash which removes a row of tiles off the board, Dragon Meteor and Power Blast, attacks a specific area on the board, the Sacred Hammer will undo the last move, a Sacred Axe attacks a column of tiles, The Avenger attacks a row and column of tiles, God's Wrath attacks a random area, Berserk attacks the entire board with mayhem and Moonrise increases the available time on the Moon Bar. 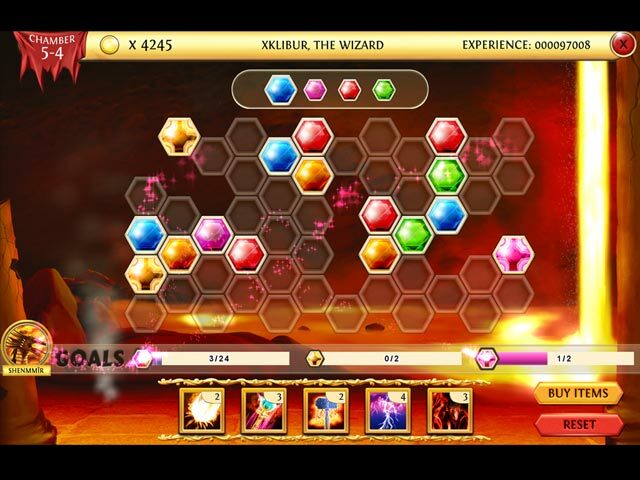 This is a decent Match 3 game with brilliant and colorful tiles. I really liked the concept of placing the tiles on the board three at a time which makes you have to think strategically, enjoy! Rated 4 out of 5 by mrm2006 from A match 3 game .... using dragon sclaes. This is a unique twist of the old match 3 game. The graphics are good. The colors easily identifiable. The music soothing and quite relaxing. There are no HOGs or mini games to break up the monotony of game play. After each "dragon board" is completed, you receive a "dragon card" bonus. You can also purchase these during game play. I never figured out how to access them to use them. The goal of the game is to place 3 dragon scales on the game board and to continue strategically 3 more colored dragon scales until you destroy a group of 3 or more like colors, While this a match 3 game - albeit a twist of one - it IS a game of strategy. The levels get much harder as you level up. I don't do well on strategy games and, therefore, dislike them. So, no purchase for me (sad face). However, I encourage everyone interested in match 3 games to give this one a try. Maybe there's a bit of dragon trainer in you! Enjoy! Rated 3 out of 5 by Dandelion48 from Mediocre This game is easy to learn and a nice challenge if you love Match3 Games. But the "Story" is nonexistent and the "Mentor" just the Assistent. Even at first try I didn´t need any helpcards and finished the game within two hours. Would be nice to have additional expert Levels our more than a few Levels to be finished in limited time. Rated 3 out of 5 by seboopsie from A fun puzzle concept but short and not very challenging That pretty much sums it up - Never used any of the power ups, you just don't need them to complete levels. Oddly some of the more challenging boards were in the middle of the game. Rated 3 out of 5 by navajoeyes2 from DragonScales: Chambers of the Dragon Whisperer Fun with a little challege but short. Relaxing with a little bit of challenge thrown in. I didn't use any of the help offered but I did when I played it each time afterwards for added fun. Rated 3 out of 5 by jil1 from Not for me. I love M3 and this one is quite different, but, in spite of bright colours and nice visual... I din´t like the game very much. Based only in demo. Rated 3 out of 5 by lvd04 from Timed This game is new and different. I love the idea of it as it involves strategy, but it's timed and you can't turn the timer off which means a no-buy for me. Rated 3 out of 5 by DiDi212 from Hmm! This review is based on about half the demo. This is different. You place different colored dragon scales on the board to make matches of at least 3. The colors I played with were pink, blue, red and green. There aren't modes to select and this is a timed game, however, I didn't have an issue finishing the board before time ran out. There are things you can buy with your game-play winnings to help with the game but I didn't need to use any of them. There is a creepy guy who walks you through the game play in the beginning, again when you reach the 2nd level, and after that he hangs around to praise you when you finish a match. Some people are going to love this game and some will hate it. I'm half way. It's not a game I would play. I'm more a fan of Fishdom 2, Farmscapes, Hexus, and Hidden Wonders of the Depths 3: Atlantis Adventures. Now those games are fun. Please see for yourself by playing the demo and reading a few reviews. I'm going to recommend this game but not buy it. Even if it becomes a Daily Deal, I won't buy it or use a coupon. I just didn't like it enough. Rated 3 out of 5 by Oldfashioned1 from Another Match-3! Basically, this is a match-3 game. You get different shaped honey-combed boards you fill with colored scales in groups of 3, trying to match 3 of one color to get rid of them. As you advance, the more challenging the board shape. There are also some spaces where you can only play a certain color. The 3 scales you get are all different colors, but you have to place them within the same area, not pick and choose. There are also some scales already placed on the board that you have to match to get rid of. Goals vary of a certain number of color matches to get (such as 3 red, 4 green, and 5 blue matches), special dragon scales to get rid of, etc. The further on in levels the fewer spaces to use and/or more colors to match. You can earn power-ups that clear a column, undo your last play, blow-up, etc. If you like match-3, this is for you. But it is more challenging because you place the scales. The first several levels were easy, but it was starting to get harder by the 3rd dragon room or so. I'm not particularly into match-3's so this isn't a buy for me, but try and see if you like it. Rated 1 out of 5 by CandyC1 from Terrible Game This is not the normal match 3 and I hated it!! Rated 1 out of 5 by hibc60 from tottally confused and don't get this one played the demo, but never got passed putting buttons on a machine never finished that before my free trial ran out, didn't have anything else to do. saw good reviews but I just don't get it. unfortunately this one is not for me.